What are the secrets of a green driveway? Well one is that they get weeds, just like lawns. Damn weeds! Yes, green driveways do take a little extra care. But hunting down weeds and pulling them out does offer some satisfaction. And also time to ruminate on weeds as a metaphor for social ills. It is much easier to remove the weeds when they are young, rather than wait until they get deeply rooted, have given birth to baby weeds, and are choking out the ‘good’ plants. So long as I stay on top of the task, it is quite easy and pleasant. Which again, is like a lot of things in life. I have become a go-to person for green driveways. A recent email asked whether we’d cut our driveway yet. Yes, I cut it last weekend with a Gardena hand mower that I’d received for Mother’s Day, four year’s ago. I’m still puzzling why my kids thought to get me a hand-mower. Perhaps it foreshadowed this whole eco-adventure? Anyway, I baby it. It’s still shiny new and cuts grass so easily I don’t know why people use gas mowers. It’s about as much exercise as pushing a vacuum, which is to say, not much. Cutting the green driveway is just like cutting any lawn. Except for the fact that we planted Eco-Lawn. Its unique characteristics are that it is slow-growing, drought-tolerant with very long roots, and only needs to be cut once a month. You can let it grow long. After 4 inches it flops over, giving it a distinctive look. However — not to disappoint my kids — but the Gardena mower may be history soon. It cuts the grass too short (42 mm or 1.65 inches) so I am on the look out for a replacement. As you can see, our green driveway is growing in a bit patchy. 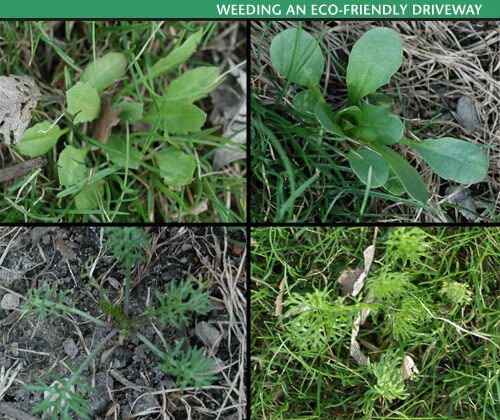 Based on a tip from Miriam Goldberger at Wildflower Farms, I over-seeded after the rain to encourage more growth, and as a natural way to fight back weeds. I directed Carole to The Green Driveway Articles, which lists all of my articles on how we built our green driveway. Green Driveway: Playing with Perception and Reality goes into detail about the PermaTURF and why we chose it. And this article: How to Build a Green Driveway in a Long Weekend talks about the laying of the base and building it. As to the question, “How has the PermaTURF performed so far, and how does the green plastic really look?”, I can say that we are delighted with the PermaTURF. It is invisible (except for some patchy areas). For Canadians, who don’t want to pay the shipping and duties from the United States, you may want to investigate a new alternative by Green Innovations’ systems called MODI. I have not seen it in person, but after reading about it on their website, I think it’s worth a look. 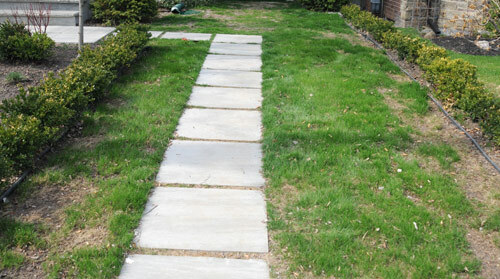 If you are thinking of building a green driveway, please send me an email: franke at frankejames.com. I’d like to feature other people’s projects in a future post. It’s funny I was thinking of you as I headed off to SOBCon08 this weekend… You were someone I definitely would have liked to meet. The conference was amazing Franke. One of our neighbors did an alternative driveway last spring, I find it wonderfully intriguing. I can’t think of a better person to lead the way.